Component subscriptions are a great way to ensure that your subscribers are only getting the notifications that are relevant to them. Through a simple tuning process, subscribers can pick and choose which components they want to receive notifications about and which they don't. The best part about this feature is that we do the magic behind the scenes to figure out who should be messaged about which incidents, and make sure that they receive all of the relevant notifications based on their preferences. 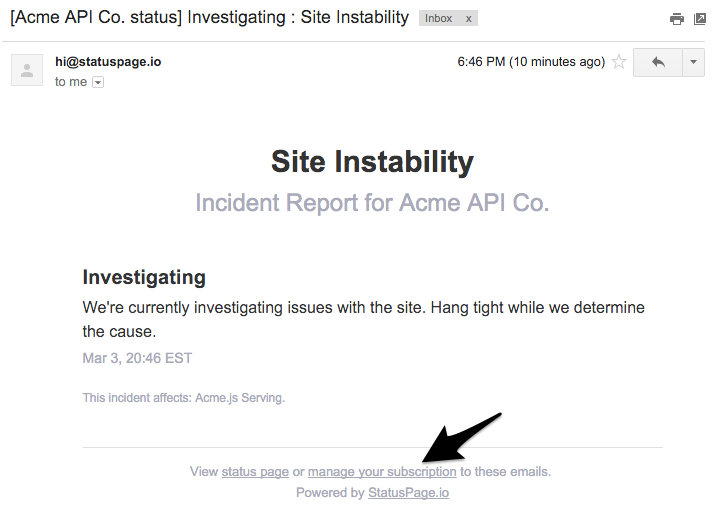 Usage of Statuspage.io from a management perspective is exactly the same, and you can open, close, and update incidents whenever you like - we've got your back to make sure your subscribers are always up to date. To start, let's imagine you have 4 components - Image Processing, API, Management Portal, and Worker Queues. One day, your database begins to incur unexpected I/O wait and things start to slow down. The Management Portal is very much affected by this - requests are timing out - but other services are still working fine. You create an incident about the timeouts and only select Management Portal as an affected Component. By default, when you select at least 1 affected Component, the Send notifications checkbox is selected. However, you have the option to deselect that if you do not want to notify subscribers but still want to show users that this incident affects a certain component. For this example, let's assume we want to notify subscribers. On incident creation, we'll check to see which of your subscribers are subscribed to Management Portal notifications, and we'll shoot them a note about the new incident. Time goes on, you update the incident a couple more times, and eventually the database slows to a crawl, making the API slow to respond as well. 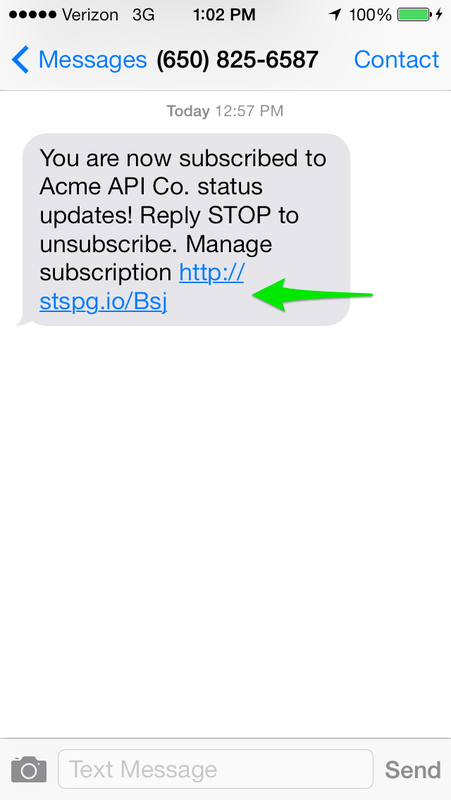 At this point, API subscribers need to be notified of this incident. Alongside a new incident update, you simply select API as an Affected Component, change its status, and click Update Incident. Behind the scenes, we notice that all of the API subscribers are now affected by this incident, and they haven't been notified of anything yet. We gather all of them up, and send them the most recent incident update you created to let them know that there's an issue. Enabling component subscriptions requires that you be on a Business level plan, and can be turned on by navigating to Notifications -> Settings. The screenshot below illustrates your other options alongside component subscription capabilities. With the basic signup flow, they simply get a success message and a confirmation in their inbox. Once component subscriptions are enabled, subscribers will be taken to another screen where they can immediately fine tune their subscription to just the components that interest them. If a subscriber hasn't tuned their subscription preferences they'll automatically be subscribed to any components. If a subscriber has already tuned their subscriptions, they will not automatically be added to new components. 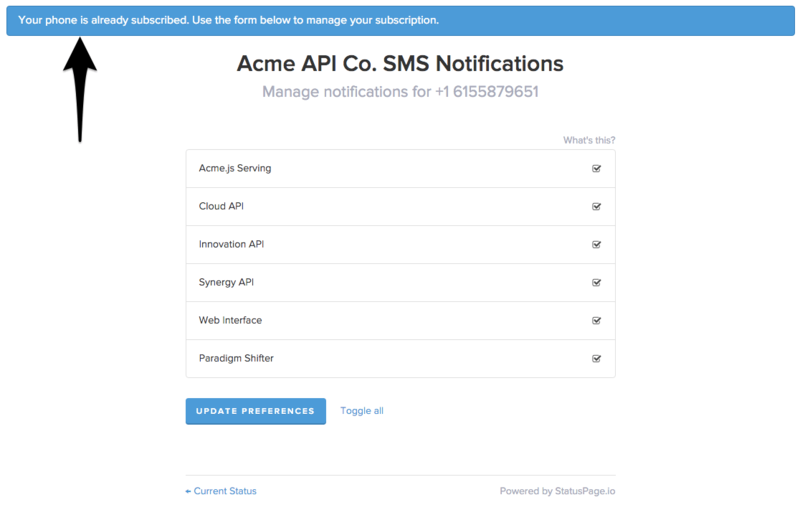 When enabling Component Subscriptions, existing subscribers will remain subscribed to all of the components that they normally receive notifications for, and will have the ability going forward to manage their subscriptions manually. The confirmation messages and all further communication to that subscriber will contain a link to the subscription management page. As an admin, you will also have easy access to this page via the management portal and your subscriber list. If a subscriber wants to unsubscribe or manage their subscription but does not have access to an existing message with a subscription management link, they can modify their subscription settings from the status page the same way they original subscribed. Note: This only works if the page has Component Subscriptions enabled. To do this, they need to go to the status page and click Subscribe, then input their email/phone number. We will recognize that they are already subscribed and they can manage their subscription settings on the next page. Copyright © 2019 Atlassian. All rights reserved.